About Me - Puffles and Pizza and Penguins Oh My! Everything Club Penguin all wrapped up in one website! This is my penguin. My name is Pailion, and I like to go on the server Marshmallow. 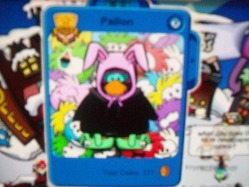 The outfit I'm wearing in the picture, (colored black, pink bunny ears, pink snorkel, black hoodie, and exclusive green bunny slippers) is my favorite outfit. I normally go on mainly in the afternoons and evenings on Saturdays. If you guys leave enough comments so I know I have some visitors, (BTW tell your friends!) I will have some parties!